The US is the world's top producer of soybeans, with close to half of the market, followed closely by Brazil. American exports made up about a third of that, or $12.4 billion, making soybeans the United States’ second-most valuable export to China after varieties of airplane. China consumes about two-thirds of the world's soybeans, which means its tariffs against U.S. producers will hurt. 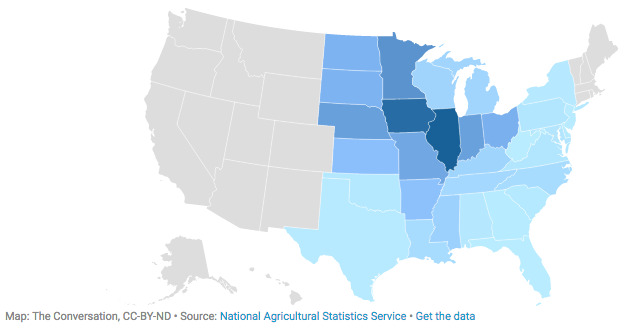 A handful of Midwestern states dominate soybean production in the U.S.
Ian Sheldon receives funding from USDA and the NSF.